Amir's natal family makes good on their threat to come back for her and she makes a new friend of her own in town. Welcome back to more everyday life on the plains of Mongolia in A Bride's Story Volume 2. 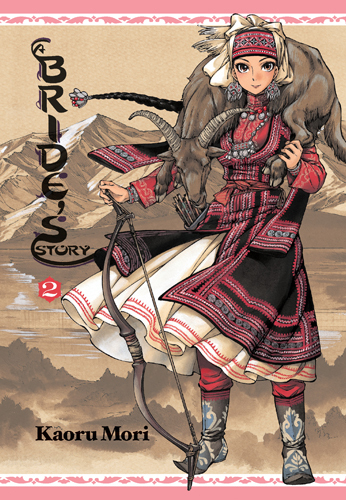 Note: A Bride's Story Volume 2 is, of course, the sequel to A Bride's Story Volume 1. The review of A Bride's Story Volume 1 is here. Otherwise, read on! Amir's tale continues at the bakery, where the women in town take their dough to finish and bake it. Public ovens such as these are common in the Middle East and Asia, where it can be too expensive, time consuming and simply too hot to keep a bread oven at home. It also gives the women in town an opportunity to gather and share the gossip with each other. Amir's still new, so she doesn't have an established clique to sit with yet. As she hangs back waiting for a spot, another young woman finally shoves the lades next to her aside and invites her over. Her name is Pariya, and she's been having a bit of trouble finding a match. She's not nearly as demure as the rest of the women in town, and besides her breadmaking her other home skills are a bit lacking as well. She's been introduced to a few prospective suitors already, but all have declined. She's very kind and loyal to her friends, however, which Amir surely needs. For Amir's family is back, and they've brought reinforcements. Amir, Karluk and Pariya take Mr. Smith to a mausoleum outside of town, and they get ambushed by her clan intent on kidnapping her back home. Pariya runs back to town to tell the people there what's happening, while Karluk tries his best to defend his wife. Later that night, with everyone safely home, the raiding party attacks again. The whole town rallies around their new daughter, and fights off the men on horseback with bricks and buckets of night soil thrown from the tops of buildings. But beyond the fighting, and where this series still excels, is showing the beauty of everyday life. As Karluk grows into the role of husband more and more, his relationship with Amir changes and matures as well. He begins to feel more comfortable around her, even starting to flirt a bit in public. He also comforts her when she is upset about her sisters dying back home at the hands of brutal husbands, and her fears of losing Karluk and her new family. Kaoru Mori's artwork shines beautifully throughout the stories, but especially in Chapter 10: Cloth Preparation. Here, generations worth of bridal dowries are brought out to show a young girl the importance of the needlework that she's doing. Mori's almost obsessive attentiveness to detail gives a richness and depth to the patterns that a lesser artist would never attempt. This beauty and artistry must be why the chapters come out monthly instead of the brutal weekly schedule of the much less artistic One Piece or Naruto. Mr. Smith's mail finally catches up with him here as well, as he is bidden to meet with some colleagues in a different village. As Amir and Karluk ride with him part of the way, they recite poetry that they make up as they go, and invite Mr. Smith to recite or sing along with them. As our newlywed couple turn back, we see that for a tribe in a nomadic land, farewells are just another part of life. Highs: As awkward as Amir might feel sometimes in her new family, they do their best to make her feel welcome. Lows: Although the moments we do see of Amir and Karluk together show their relationship developing, it would be nice to spend more time with them together. Verdict: A beautiful story, both for its art as well as its portrayal for the characters and story within.